As supporters of the Wet’suwet’en First Nation’s Gidimt’en clan continue to protest outside the Nelson constituent office of MLA Michelle Mungall, the Minister of Energy, Mines and Petroleum Resources said the office will remain closed until further notice. The decision comes after a protester chained herself to the front door of the Josephine Street location Monday following a meeting between the protest group and Nelson-Creston MLA. "The reason why we've had to temporarily close the office is my responsibility to my staff, which is to assure they have a safe work environment and that they're not going to be unduly harassed and that they'll be able to serve all constituents when they go to work," Mungall told The Nelson Daily Thursday afternoon from her office in Victoria. "Unfortunately, I can't assure that for my staff and, of course, I have to be pro-active and not reactive to these concerns." Mungall's office has been bombarded with protests since the RCMP removed a blockade of a forest service road southwest of Houston, B.C., to stop construction of the 670-kilometre Coastal GasLink pipeline earlier this year. The $6.2-billion project is being constructed to move natural gas from Dawson Creek to a proposed facility in Kitimat. The decision following an interim injunction from the B.C. Supreme Court in December 2018, which resulted in the arrest of 15 people at the camp, sparked outrage, followed by protests across Canada, including Nelson. 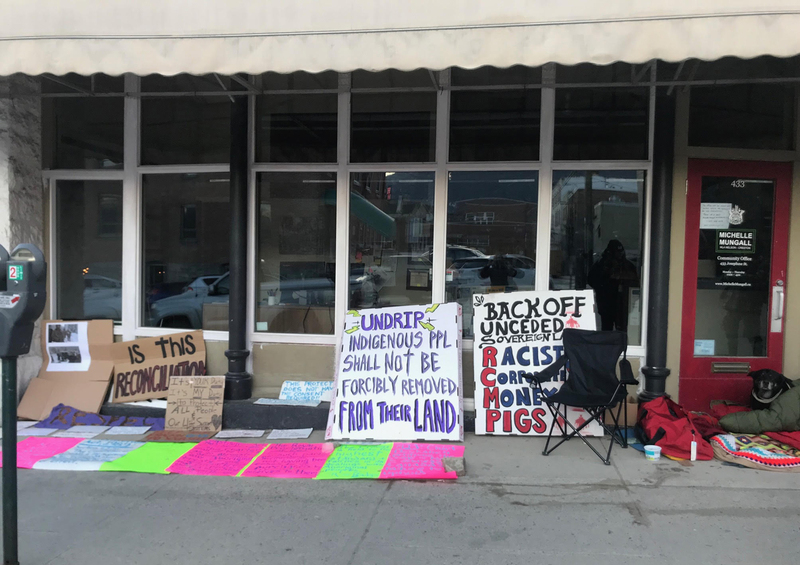 Protesters at the make-shift shrine in the 400 Block of Josephine Street said Mungall did not answer all of the questions during the meeting that was set up after an earlier rally that occupied the outside the Nelson office, forcing Nelson Police to attend. Mungall said tensions escalated Monday when it was time to end the meeting. “No arrests were made but it took several hours for (the person) to agree to leave,” Mungall added. At the root of the issue is the fact that the Wet’suwet’en’s band council agreed to support the $13-million pipeline deal while its hereditary chiefs have unanimously denounced that agreement. “I can't speak for people who are protesting, but our job in government is for reconciliation . . . and reconciliation is not just for government, it's for all people,” Mungall said. Mungall said there is no time frame to when the Nelson office will re-open. During the closure staff continues to work every day from a different location, answering emails, responding to constituents by telephone — just not available in the physical space of the constituency office. “I'm not so sure what would satisfy the group of protesters,” Mungall said. “I heard them out but I don't know what exactly are hoping to achieve.